You may not be able to afford a stay at the five star Windsor Hotel but you can have a look at the Grand Ballroom for free. ........and is classified by the National Trust. It's certainly an imposing building and is easy for you to find, being located opposite Parliament of Victoria. It's played a significant role in the history of Australia as the place where the Constitution of Australia was drafted in 1898. A lot of notable people have stayed here according to Wikipedia - including 5 Australian Prime Ministers, Margaret Thatcher, Lawrence Olivier and The Australian Cricket Team!! You should pay a flying visit because the building is so famous. .......Just ask the doorman and he'll point you in the right direction. The address is 100-150 Spring Street but you can't miss it, it's right opposite Parliament House. Click on the blue writing beneath the map for a better idea of it's location. 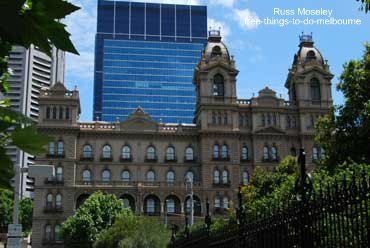 .........You should also go to the Old Treasury Building which is also close by on the other side of the road. 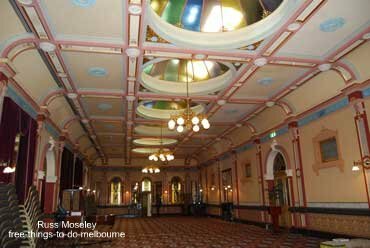 This building has lots of good information about Melbourne in the old days and it has the original gold vaults which you can walk round. Another good place is the toilets at Hotel Sofitel. Oops, not just any toilets there but the 35th floor toilets. They have a floor to ceiling window with an amazing view over Melbourne, especially at night when there's sport on at the MCG.